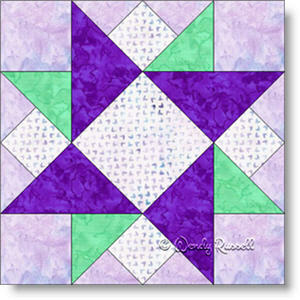 The Triple Star quilt block looks more like a pinwheel block to me. However, I imagine that the name comes from the fact that everything but the background fabric seems to form a type of "star". Although this quilt block might look challenging, it really is not. The method of construction is what makes it look difficult, at first glance. Groups of quilt patches are created and then those groups are sewn together into diagonal rows, rather than the usual straight across rows. This is a fun block to make, so don't be shy to give it a try. The sample quilt layouts show both quilts with blocks laid out on point. However, by simply changing up the background colours you get two totally different looks.